One of Britain's top jazz events has been given a cash lifeline to keep it swinging in the future. The Welsh Assembly Government is giving more than £380,000 to secure the future of the Brecon Jazz Festival. Two years ago, the effects of the foot-and-mouth crisis, together with a lost sponsorship deal, almost closed the festival down completely. The money will pay off existing debts and set up a new company, based at the town's Theatr Brycheiniog, to run the event. The summer festival is estimated to bring around £1m in to the local economy, equivalent to creating more than 20 jobs. 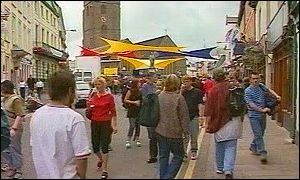 In 2001, BBC Wales announced a three-year deal for exclusive rights to transmit TV and radio coverage of the festival. The £75,000 deal came after two major sponsors - Hyder and British Airways - had pulled out. It is estimated more than 50,000 people visit the market town during the festival. Despite the event's success, Theatr Brycheiniog was last year asked to become involved with the management of the festival. The assembly government believes that a professional management team would find it easier to deal with licensing issues, control of the event, and crowd control. First Minister Rhodri Morgan said: "Brecon is widely regarded by musicians from all five continents as Britain's top jazz festival. "It brings thousands of visitors to Wales from around the world. "Brecon Jazz also helps to build Wales's international reputation for staging major cultural events and the festival brings major economic benefits to Brecon and Mid Wales." Culture Minister Jenny Randerson added: "This year will mark the 20th anniversary of the festival. "I am keen to ensure that the 2003 festival remains true to the traditions and artistic standards we have come to expect. "The funding we have committed to the festival will guarantee that Brecon Jazz continues to play a key role in the Welsh cultural calendar." The cost of staging the event is around £330,000 - with £160,000 of that going towards attracting some of the world's top names. Previous headlining acts have included Sonny Rollins, Courtney Pine, Dr John, Andy Sheppard and George Melly.